While it seems the movie element of the "Star Trek" universe is dead in space, the TV side of things is prospering. Fans have been clamoring to know more about the new series starring Patrick Stewart as Jean-Luc Picard ever since it was announced in August of last year. The destruction of the Romulan homeworld in 2009's film "Star Trek," Kurtzman said, was a defining event in Picard's career, one that sets up the role Stewart will play on the still-untitled new show. "Picard's life was radically altered by the dissolution of the Romulan Empire," Kurtzman explained. He added that Stewart himself loved the show's new premise once he saw how different his reprised role would be. "He [Stewart] threw down an amazing gauntlet and said, 'If we do this, I want it to be so different, I want it to be both what people remember but also not what they're expecting at all. Otherwise, why do it?'" Kurtzman said. According to Kurtzman, after reading the creative team's 34-page pitch for the new show, Stewart "walked into the room and he had a huge smile on his face and said, 'This is wonderful.' He knew if he was going to go back to Picard, it needed to be for the greatest reason ever." Details about the new series are scarce, but it already appears as if Picard won't be overseeing the personal and political problems facing his crew and the cosmos in the style of "The Next Generation." Kurtzman did add, however, that "anything could happen," when asked whether some of the old "TNG" cast would show up on the new show for a cameo or two. Other events in the prime timeline, such as the Dominion War, could have similarly impacted Picard's life. effects. Picard's involvement in that conflict was really covered only in the novels (the 1998 "TNG" novel "Behind Enemy Lines," in particular), but it was nonetheless a significant event in Federation history. During the "TNG" two-part episode "Unification" (S05, E07 & 08), Picard teamed up with Ambassador Spock, and together they learned that the Romulans' claimed effort at peace with the Vulcans was actually an attempt at a coup d'etat. 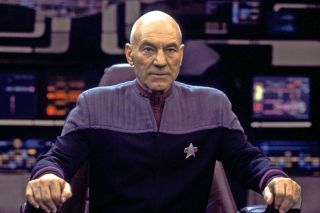 Later in Trek history, in the movie "Star Trek: Nemesis," Picard must do battle with a clone of himself (Tom Hardy) who was created by the Romulans. In other Trek news, Kurtzman also told The Hollywood Reporter that there will be two new installments of "Star Trek: Short Treks," as well as another animated series. Back in October of last year, CBS announced plans for "Star Trek: Lower Decks," a half-hour animated comedy series about the lowest-ranking crewmembers on one of the least notable ships in Starfleet. That series will come from Mike McMahan ("Rick and Morty"). The two new "Short Treks" will also be animated and will premiere in the spring, once the second season of "Star Trek: Discovery" is over. "Our goal is to not only expand the definition of 'Star Trek' and what has qualified as traditional 'Star Trek,' but also to tell stories that are both self-contained in a very short period of time [and] that also connect to the larger picture of what we're doing, not only in 'Discovery' but in the world building of Trek in general," Kurtzman told THR. "And you get to tell these very intimate, emotional stories that are side stories to characters. So, you get the benefit of the experience in and of itself, but then when you watch 'Discovery,' you'll see that these were all setting up things in the world of Season 2." There's no word on whether the shorts will be available on any services in the U.S. other than CBS All Access. "Short Treks" is being shown in the U.S. on CBS All Access. In Canada, it's available on the channel Space and the online service Crave as well as the Snackable TV app. Sadly, fans in the U.K. and Europe miss out, as there are no plans for Netflix to show the shorts as yet. The first season of "Star Trek: Discovery" is available to stream in its entirety on CBS All Access in the U.S. and on Netflix in the U.K. "Star Trek: Discovery" Season 1 is available on Blu-ray now. The second season of "Star Trek: Discovery" will consist of 13 episodes, with no midseason break. It will premiere on Thursday, Jan. 17, in the U.S. and Canada, and it will be released in the rest of the world on Friday, Jan. 18.